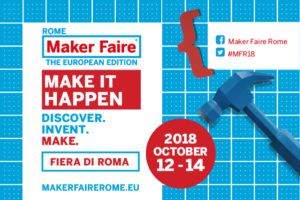 The countdown has begun for the Maker Faire European Edition, the sixth edition, that will be held in Rome – Italy – from 12th to 14th of October, 2018. Maker Faire is the most important show of innovation in the world – a “family-friendly” event full of inventions, creativity and inventiveness, and a celebration of culture and #makers movement. It is the place where makers and enthusiasts of all ages and backgrounds meet to present their projects and share their knowledge and discoveries. Maker Faire Rome is the largest Maker Faire outside the United States. An event in continuous growth that, in the last edition and in just three days, has made to realize over 100 thousand visitors. Come and visit us at Maker Faire – Rome – Italy!